Stonebrook Day School‘s curriculum relies on play-based learning. 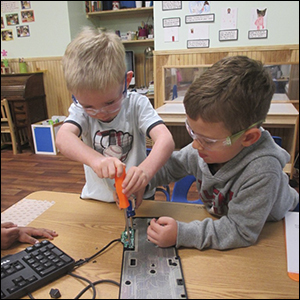 Play-based learning is an active, hands-on approach to education that compliments the inquisitive nature of a child. Children develop concepts over time using inquiry-based learning and project approach. Projects for discovery are derived from knowledge of the children as well as from child interests and questions about the world (emergent curriculum). The curriculum is integrated across the many domains of learning. What emerges from the children becomes the curriculum. Emergent curriculum is built on a trust in the power of play and on the concept that children are active rather than passive learners and learn primarily by doing rather than listening. Teachers observe what children are interested in and write up plans for possible activities that support and extend those interests. Open-ended topics are the starting points for an emergent curriculum. In evaluating effectiveness, teachers consider what was planned, what happened and what was learned. Assessment is through developmental portfolios of each child is compiled by the teacher over time. The teacher serves as the recorder of children’s activities. Science and Technology, interpreted through Engineering and the Arts, conveyed through reading and writing, all based on elements of Mathematics (STEAM). STREAM education is a critical component in developing student critical thinking, problem-solving and collaborative skills. Displaying what we have learned through stories, journals and visual arts (2 and 3-dimensional creations) promotes the integration of literacy and the arts. Learning starts with a central question – for example, “how does a chick know it is time to hatch?” question from a student. We begin as a group thinking about what we know and what we don’t know as well as what we want to know about this question. Students and teachers identify resources that may help to answer these questions – perhaps books, web searches, or interviews of knowledgeable people. In this manner, the project begins to unfold. Teachers will document the children’s investigation throughout the project.